Can I connect EOS 760D, 750D or 1300D to a computer with wifi? EOS 760D (Rebel T6s), EOS 750D (Rebel T6i) and EOS 1300D (Rebel T6) all have built-in wifi, but it is NOT possible to use the Canon EOS Utility software and connect the cameras to a Windows or Mac computer using wifi. 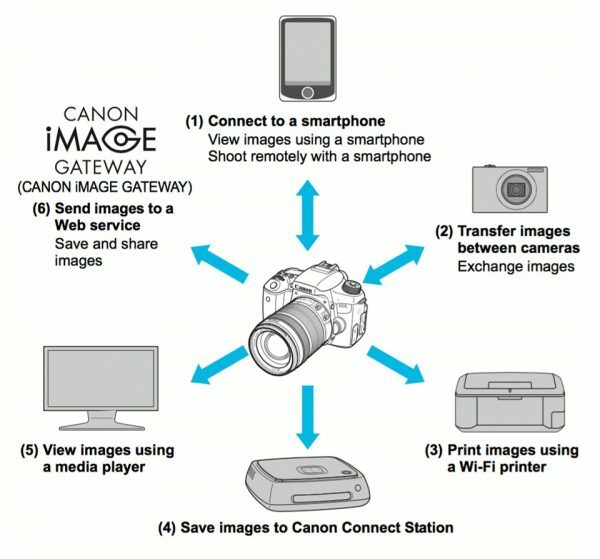 The first page of the EOS 760D wifi manual has a diagram that shows the possible connection types, you can see there is no mention of connecting to a computer with EOS Utility. For some reason – Canon has chosen not to enable this feature on these three cameras. Canon must have seen the error of their ways, as the newer EOS 800D and EOS 77D – replacements for the 750D & 760D do allow connection to EOS utility with wifi. Thanks to everyone that asked, hope this clear it all up. You can use EyeFi cards in these cameras, and the TetherTools Case Air will also work if you need to connect the camera to your computer with a wifi link. Update: As soon as I shared this post on Facebook I received another question, does this also apply to the EOS M5. Sorry to say that yes all the current mirrorless M-series cameras, M, M3, M10, M5, and M6 also cannot connect with WiFi to EOS Utility. The rules of rules are that there has to be exceptions to the rule. For mirrorless cameras, the EOS M50 can connect to a computer using WiFi and work with EOS Utility. It is the exception to the rule. Update2: EOS 2000D and EOS 4000D share the technology platform with the EOS 1300D, as such they also don’t connect to a computer with their built-in WiFi. 15 Responses to Can I connect EOS 760D, 750D or 1300D to a computer with wifi? Sorry you can’t connect to DLNA devices with EOS 1300D. I have Canon eos 750D and in camera connect menu I am not able to see computer icon for connect just camera/phone/printer/web/screen icon available. Can I operate camera thought pc or download pictures to pc ? No you cannot connect the EOS 750D using Wi-Fi to your computer. Yes you can connect the EOS 750D to your computer with a USB cable. You can’t transfer movie files from the camera to your phone. It’s written in one of the notes in the WiFi instruction manual. Hi, so following from the last post about not being able to transfer movie files from the 1300D to computer.. how else can we get hold of these videos then? The previous comment was about transferring movies to a phone with Wi-fi. You can transfer movies to your computer by connecting the camera to the computer with a USB cable, or by taking the SD card out of the camera and putting it in an SD card reader in your computer. You mentioned using EyeFi cards and the TetherTools Case Air for 760D, can it be used for Remote live shooting with EOS Utilities or Lightroom? How about using Toshiba Flash Air SD card? You can’t use EyeFi cards or the TetherTools Case Air for remote live view shooting with EOS Utility – that only works with the cable for the EOS 760D. You can use TetherTools own app with the Case Air for live view shooting. If you use the EyeFi cards or TetherTools Case air to automatically transfer images to a folder, then you can auto import to Lightroom from that folder, but it’s not Live View shooting. Do you know if this also applies to the Canon EOS 4000D? Yes indeed the EOS 2000D and EOS 4000D cannot use their wifi to connect to a computer, only a smartphone / tablet. This is since these cameras are essentially using the same technology platform as the EOS 1300D. Concerning the 800D connection to EOS utility with wifi, can the transfer to your computer be automatic like with a Eyefi SD Card?